Yes, I’m back in America. And yes, Dragon Boat Festival happened over a week ago. But it’s an important Chinese holiday and I have some pictures to share, so the blogging continues! Dragon Boat Festival, or Duanwu Jie, is a summer holiday celebrated in southern China and a number of other countries in Asia. Lucky for us, Nanjing just barely qualifies as a southern Chinese city because it’s on the Yangtze River (of course, this is also why none of the buildings in Nanjing have heat, so we weren’t exactly thrilled to be living in the “south” during the winter months). Dragon Boat Festival is celebrated on the fifth day of the fifth lunar month, which was June 23 this year; the festival has a number of different origin stories and involves many different customs, including the racing of dragon boats and eating of zongzi– pyramid-shaped balls of sticky rice with sweet or savory fillings. Zach and I had already planned to visit Guilin the same weekend as the dragon boat races in Nanjing, but we did have a chance to see some people lining up to watch the races in Guilin as we headed out for our bamboo raft ride (we didn’t get run down by any dragon boats while we were cruising down the Li River, as exciting as that would have been). So instead we visited Mochou Lake, Nanjing’s dragon boat destination, on Sunday after the races. With the races over, we enjoyed a pleasant stroll around the lake with our Fulbright friends, checking out the parked dragon boats and some potted lotus plants that were on display near both entrances to the park. It was neat to see the lotus flowers close up, since you normally can’t appreciate the details of the plants from the banks of whatever pond or pool they are growing in. We missed the races, but we had a nice afternoon at the lake with our friends, followed by a delicious farewell dinner (for me– the rest are all still in Nanjing for a little while longer!) at our favorite Yunnan restaurant. Mmm…I miss it already! Last night at 2:30 am, we got back to our apartment from a quick two-day trip to Guilin and Yangshou in southern China, and this morning I was already super excited to look at our pictures! We had a great weekend getaway to these two spectacular towns known for the stunning karst mountain scenery. We flew into Guilin Friday midday and got picked up at the airport by a driver from our hotel (a nice treat for the two of us, who are not accustomed to such pleasantries) and spent the afternoon walking around Guilin’s lakes, rivers, and peaks. Our hotel was located on the lakefront, which was great because any time we wanted to go somewhere, we could take a nice stroll along the lake to get there. The highlights of our day in Guilin were seeing the Sun and Moon twin pagodas out in the middle of one of the lakes– we didn’t go in them, but just enjoyed the view from the shore. One of them is the tallest copper pagoda in the world (one of those interesting Chinese superlatives) and they were both beautiful during the day and after dark, when they were illuminated. We also took a stroll to the Guilin Normal University campus, which is housed on the site of a former Ming prince’s mansion. The Ming-era (1300s) stone stairs and rails are still there, though the buildings have been rebuilt. On the north side of the campus is Solitary Beauty Peak, one of the many rock formations that rises sharply from the surrounding area. It was a short but steep climb to the top, where we could get a nice view of Guilin and the Li River. That evening, we found a riverside restaurant and enjoyed a Guilin specialty– a whole catfish cooked in a beer sauce. It was delicious! On our second day, we had booked seats on a “bamboo” raft tour that left from Yangdi Pier, south of Guilin, and then on a bus to the nearby town of Yangshuo. The rafts are actually made of PVC pipe that is textured to look like bamboo (but isn’t fooling anyone), and they have a cover and two or three benches on them for passengers. We had a fun ride, sharing our boat with a couple of recent college grads who have been teaching English in Shanghai. The scenery was just incredible– although the weather was rainy for our whole trip, the result was mist hanging in the mountains and creating a real-life Chinese landscape painting on every side. We also enjoyed our tour guide, who hopped from raft to raft and had a strange sense of humor (for instance, he told the English speakers that his English name was KFC; he told the Chinese speakers that they could call him by the nickname “Dog Meat” because in Guilin people like to eat dog meat). We spent the afternoon in Yangshuo, where we had wanted to climb Green Lotus Peak but were unable to do so because the mountain path was closed in rainy weather. Instead, we just enjoyed the park around Green Lotus Peak, which had some nice pavilions for viewing Yangshuo and the Li River, some fantastic bonsai trees and rock gardens with a charming coat of moss, and a lot of calligraphy carved into the side of the mountain. It was a great place to spend the afternoon and to escape the crowds. We had dinner at a cute cafe on an alley off of Yangshuo’s pedestrianized West Street (Xi Jie) called Kelly’s, where I enjoyed an awesome veggie cheeseburger and Zach had a regular cheeseburger, and we both had fresh milkshakes (mine was Mango and Zach’s was vanilla). We checked our flight status using Zach’s iPad and their free wireless while we sipped, and then caught a bus back to Guilin in time for our 11:45 pm flight. While we had heard that both Guilin and Yangshuo were popular destinations for foreigners (and backpackers especially, because of the natural beauty and host of outdoor activities), perhaps because of the stormy weather we didn’t encounter too many crowds. We did stay pretty damp the whole time and our feet were a little pruney by the time we finally got back to Nanjing last night, but we loved every minute of our mini-vacation. Now, it’s already time for me to start packing again– but a bigger suitcase this time! This weekend, Zach and I enjoyed a great visit from our friend Abby, another Fulbright student living in Xiamen. We did some hiking on Purple Mountain, walked around Xuanwu Lake (which was her favorite part of Nanjing), and visited the Imperial Examination Museum in the Confucius Temple area to show off the quirky test-taking mannequins and the cheat sheets they made with “mouse-beard” brushes (I first blogged about this museum in October, but it’s still one of my favorite museums in China– an interesting topic, a historic place, and some very entertaining displays!). We enjoyed some great meals together and even had a chance to catch a movie– The Hunger Games— at one of the fancy malls in Nanjing. This week, Zach’s working at the Nanjing Municipal Archive and I’m planning to take one last research trip to the Nanjing Massacre Memorial. This weekend will be our last weekend together in China, so we’re taking a two-day trip to Guilin and Yangshuo to check out the famed karst scenery. When we get back to Nanjing, the Dragonboat Festival will be in full force, so I’ll have plenty to blog about during my last few days in Nanjing. It’s hard to believe that I’ll only be in China for a little over a week more. Thinking back over the past nine months, I can remember plenty of times when Zach and I fantasized about the frozen yogurt and burritos we would eat when we returned to Chapel Hill. But most of those times were months ago…frigid winter days when we sat huddled in blankets in our apartment, and the people we Skyped with had no idea how much time had passed since we had last worked up the nerve to shower in our 40-degree bathroom. Now Nanjing is steamy again. When I walk up the dark, dusty stairs to our fourth-floor apartment, I can recapture a tiny bit of the feeling I had the first night I walked up those stairs with Zach, unable to see what was around me and unsure of what I’d find at the top. We’ve been back in Nanjing for about a week, after spending the previous three weeks in Beijing. Despite consuming a seemingly endless stream of excellent food in Beijing, while we were there we fantasized not about the meals we’d eat in Chapel Hill, but about the favorite restaurants we’d revisit in Nanjing, our home-away-from-home. Talk to (and understand) strangers– a skill I’ll never take for granted again! The poodles! Oh, the poodles! Dare I say, the sound of firecrackers when a store opens at eight in the morning? Our year in China may not have turned out exactly the way Zach or I expected, but we’ve learned a lot and had a lot of fun. Next time Zach’s here, he’ll hopefully be working with a more open and accessible library or archive. Next time I’m here, I’ll speak more Chinese (I’m going to go ahead and call that one as a lifelong learning process) and I’ll take more pictures of food (I’m talking everything I eat!). We’re both looking forward to being back home…but I know we’ll also look forward to the next time we’re in China. On our last weekend in Beijing, we took an afternoon trip with the Fengs (Zach’s former host family in Beijing, whose daughter, Shannon, we do English lessons with over Skype) to Xiang Shan, translated as Fragrant Hills in English (the fragrance in question is incense, for the highest peak, Incense Burner Peak). The mountain was close by, so it was only a 30-minute drive or so from the Fengs’ apartment in northwest Beijing, and the day was beautiful. I can’t believe how many days we had in Beijing with a blue sky, a cool breeze, and even some puffy white clouds! Feng Yao navigated his SUV through the alleys and rural neighborhoods up the mountain until we finally found the parking lot outside the north gate of the park– I’m not sure how people reach the mountain if not by car. I think there were some bus stops farther down the mountain and people could walk up from there. 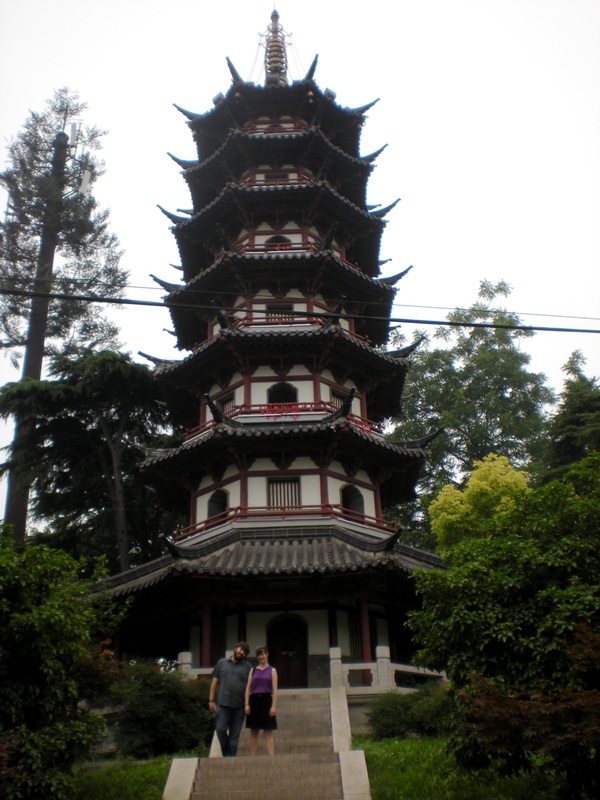 Our first stop was Biyun Temple, or Temple of Azure Clouds. The temple was originally founded in the 1300s and has a number of interesting features. Shannon was particularly interested in the wild strawberries growing throughout the temple grounds. It’s built on a north-south incline, so the views from the pagoda at the north end of the temple were really lovely. It also has some significance as the place where Sun Yat-Sen’s body was entombed for four years before being moved to the mausoleum in Nanjing, so the temple had a couple of rooms devoted to exhibits about Sun Yat-Sen and displays of his books and calligraphy. The temple even had on display a glass-lidded coffin that was a memorial gift from the Soviet Union, but which was never used because Sun Yat-Sen had already been entombed by the time it arrived in China. Apparently, Sun Yat-Sen’s clothes and hats remain inside the pagoda, which has some very unique stone architecture in the shape of a series of towers of ceramic tiles. Another one of my favorite parts of the temple was Arhat Hall, a hall with 512 life-size wooden statues, most of Arhats (Buddhists who have reached a certain level spiritual attainment) lined up in several concentric rows with narrow passages between them. It was fun to wander through the statues looking for idiosyncrasies– a large forehead here, an impressive mustache there. After visiting so many temples during our year in China, it’s rare to find part of a temple that evokes a genuine sense of mystery like this hall did. After our visit to Biyun Temple, the skies were growing dark with storm clouds, but we walked a little farther into the park anyway through some flower gardens and ponds. We didn’t get a chance to go far before it really started to pour, though, so we sought shelter in a hotel lobby (which the staff seemed none too happy about) until the rain lightened up enough for us to get back to the car without getting completely soaked. On our way down the mountain, we made a stop at a restaurant whose specialty was rural food of Northeast China, so we had dinner and enjoyed some of Feng Yao’s favorite childhood dishes, including a giant block of delicious tofu, slices of smoked tofu with stir-fried spinach, fish encrusted in nutmeg and other spices, millet, and various bing (savory pancakes eaten in Northern China instead of rice). We had a fun trip to Beijing, starting with the few days we spent with my family and finishing with a week at the Fengs’ house. Zach was able to get a lot of work done at the Beijing Normal University Library, I spent some time writing poetry, drawing with pastels, and just hanging out with Shannon, and we ate a ton of great food! Yesterday afternoon we left on the high-speed train, though, and were glad to return to our own apartment and the unique charms of Nanjing. And now I have a feeling that the next two weeks– my last of this trip to China– will really fly by. Most of the replicas were about the height of a person, with a few favorite landmarks, like the Eiffel Tower and the Great Wall, looming larger to allow for better photo ops (or, in the case of the Great Wall, to allow visitors to walk along the 20-foot stretch of wall replica). The level of detail on the replicas was truly fascinating– although many of them had chipped paint or plants sprouting from the roof to give the lie to their small scale, the minute masonry and architectural flourishes on the castles, cathedrals, and monuments was pretty neat. All throughout the park, costume rentals were available, sometimes region-appropriate, so that women could put on a Victorian dress and pose in front of the gardens at Versailles or don a gauzy sari and sit on top of a camel in front of the pyramids. There were also a few bizarre thrill rides– one Santa Claus themed, and another a train roller coaster that made the Grand Canyon replica seem more like a Thunder Mountain Railroad replica. The park was pretty Europe heavy, with a number of noted Asian buildings in the mix and a bizarre Africa section that included several Egyptian sites and then a bunch of thatched-roof huts and a few animals. While some people try to take forced-perspective photographs with the replicas to create the illusion of actually being at the place, I felt more like Godzilla or King Kong than a tourist. Having been taller than the White House, I can now totally understand why those movie monsters just want to smash everything (i.e. because they can)! Yesterday afternoon, we concluded a wonderful two weeks with my parents, my younger brother Daniel, and Daniel’s girlfriend Heidi. I had been planning for their visit for weeks (it was the welcome distraction that got me through the insanity of grading research papers and final exams!) and overall we had a great time. The trip started when my family arrived in Shanghai. The plane had come in a little late, so we opted for cabs to the hotel rather than the subway, which takes about an hour and a half. In Shanghai, we stayed in the Ruijin Guesthouse, a converted villa in the French Concession area where Zach and I had stayed before. We love the way the green grounds serve as an oasis amidst the bustle of Shanghai (even when the hotel seems to be under perpetual renovation). The weather was rainy for the two days we spent in Shanghai, but that didn’t keep us from trekking out to the Bund for a somewhat limited view of the Pudong skyline, and my family got a chance to see plenty of other futuristic buildings on our other sightseeing adventures. We spend most of our first day in the Shanghai Museum, exploring everything from the ancient bronzes to the Ming furniture. On our second day, we had a brief respite from the rain that allowed us a walk through the French Concession and Old City, stops in a couple of parks along the way, and a visit to the Yu Garden and Bazaar. We also visited the Shanghai Circus World to give my family a taste of the intersection of Chinese acrobatics and Cirque du Soleil. It was a good way to keep everyone awake! After Shanghai, we made a one-day stop in Suzhou on the way to Nanjing to take a look at the famous canal city. The weather finally cleared up, so we had a sunny day for climbing the pagoda at Beisi Ta and walking through the sprawling Humble Administrator’s Garden and the spectacularly designed Suzhou Museum. Zach and I were especially interested in a special exhibit on snuff bottles that had hundreds of examples of this intricate Qing-dynasty art form. Having left our luggage at the train station counter, so we picked it up in time for an evening train to Nanjing and I grabbed a couple of pizzas for dinner while Zach checked my parents into the Xiyuan Hotel on Nanjing University campus. 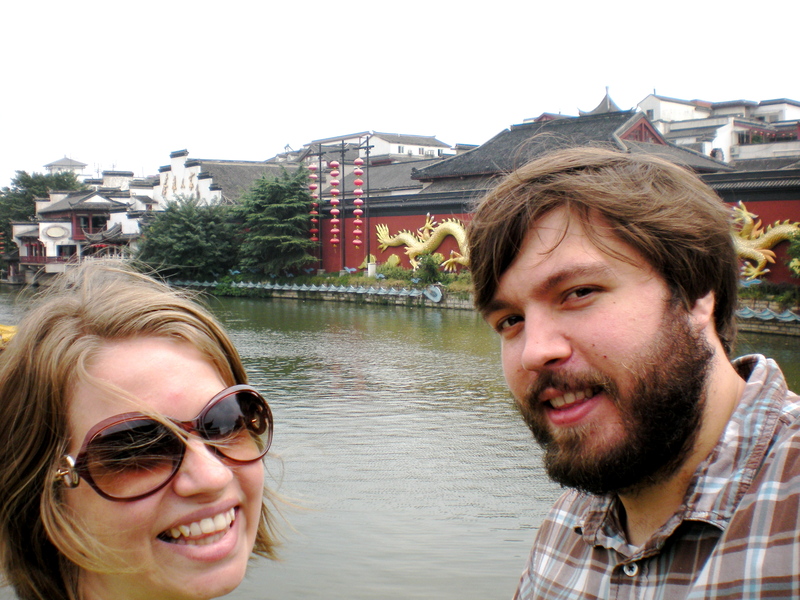 We spent our first day in Nanjing strolling around the Xuanwu Lake Park, one of my favorite spots in Nanjing. I packed sandwiches from Skyways Bakery for us to have as a picnic lunch at the lake, and we also made a stop at Jiming Temple, just inside the city wall, to burn some incense and take in the views. While it isn’t the most impressive temple in China, it has an undeniable hometown charm that everyone enjoyed. After just one day in Nanjing, we hopped on an overnight train to Huangshan, one of the most renowned mountains in China and World Heritage site galore. We had spectacular weather for our two-day hiking trip, with clear skies and great views both days. Although the mountain was crowded, Zach and I were excited to have a chance to see some more of the western peaks, which were completely clouded over on our previous visit, and I think everyone enjoyed the unique landscapes and the poetic trail signage. After making our way down the mountain, we had just enough time to squeeze in a trip to the nearby village of Hongcun, where we had a nice lunch and stroll. Despite some problems finding bus transportation home (which ultimately involved waiting on the side of a highway to hitch a ride on a different bus than the one we had booked, and then three of us sitting in the aisle of the bus for half the trip), we made it back to Nanjing none the worse after two days of early rising and stair climbing. We spent the next few days in Nanjing visiting the Nanjing Massacre Memorial, the Confucius Temple, and the Presidential Palace, but mostly sleeping in and resting up! I took everyone around the city while Zach enjoyed a couple days off from being our on-duty translator. Nanjing University was lit up with red and green lanterns and adorned with flower displays for a 100th anniversary celebration. Zach and I were excited that everyone enjoyed our very favorite restaurant, a little Yunnan restaurant around the corner from our apartment that serves some amazing seasoned fried lotus strips, a vegetable called “dragon bean,” and balls of fried dough with bean paste and rose petals inside. We even went back a second time! My parents also discovered the joy of the Chinese McFlurry and the many sidewalk freezers full of ice cream bars—the nectar of summertime in China. For the last leg of our trip, we took the high-speed train to Beijing for a four-day visit. The skies were uncommonly blue and beautiful, especially for the last three days—a welcome surprise! We stayed in a nice hotel called the Red Wall Garden Hotel located in a hutong (traditional courtyard housing) in the center of the city. After checking in, we had time for an evening stroll over to Beihai Park, where we ate at a Cantonese restaurant and walked back through the brightly lit Houhai area and enjoyed some street snacks. We spent our first full day in Beijing walking to Tian’anmen Square and the Forbidden City. The day was hot, the Forbidden City was vast, and the trees were few, but an ample lunch of assorted dumplings and frequent breaks inside the Imperial palace kept our energy from flagging. Our second day in Beijing was reserved for a trip to the Great Wall. When we found out our hotel had booked as a driver and a tour guide (rather than just a driver), we weren’t too worried, but it turned out the tour guide had different plans than those Zach and I had made. While we had asked to go to Mutianyu, a stretch of wall farther from the city than Badaling, the most visited stretch, he suggested we visit Juyongguan instead, suggesting that it would be less crowded. Since we had never been to (or heard of) this stretch of wall, we agreed, but I think he was actually more interested in its proximity to several other tourism stops—like a jade factory store and a cloisonné warehouse plus cafeteria—than its inherent value. Although Zach and I were frustrated by the experience and we were sorry to miss out on some of the beautiful panoramic views at Mutianyu, the mountains at Juyongguan were stunning in their own right and we all got to spend a couple hours hiking on the Great Wall of China! We also had time for a stop at the Olympic Stadium Park to see the bird’s nest and water cube (which Daniel does not like to hear called a cube) before heading back to the hotel. For a chance of pace, we spent the next day investigating a few lesser-known (or at least less frequented) spots in Beijing, although we started with the Temple of Heaven, once of Beijing’s most iconic sites. Technically an altar rather than a temple, the Temple of Heaven includes a round building in which the emperor made sacrifices to ensure a good harvest, another round building in which ceremonial objects were stored, and a round altar on which a sacrificial bull was slaughtered—all surrounded by a massive park the size of the Forbidden City. After our morning in the Temple of Heaven, we disappeared into the Ancient Observatory for a peek at some ancient astronomical instruments created in the 17th and 18th centuries under the guidance of Jesuit astronomers and boasting some neat Chinese flourishes. Next, we made our way to Beijing’s Hui Muslim district for a trip to Cow Street Mosque. Though I’d forgotten to dress conservatively, the gate attendant kindly provided long skirts for Heidi and I to wear over our exposed legs and a shawl for me to put over my v-neck shirt, and we were free to explore the mosque. With Chinese architecture, the mosque’s appearance had a lot in common with Buddhist temples, but the flourishes of Arabic calligraphy revealed the difference in purpose. Finally, around the corner we found the Fayuan Temple, arguably the oldest in Beijing and now functioning as a college for monks. As we entered, the monks and a handful of lay Buddhists were just exiting the first hall to make a circuit around the courtyard while chanting. We observed the service, Zach and I reminded of our undergraduate trip to South Korea and the amazing few days we spent at a college for Buddhist nuns. After they had reentered the hall, we quietly continued through the temple complex, peeking in the windows of some closed buildings and glimpsing the assortment of Buddha statues and other stored objects inside. We rounded out our day with dinner at a Muslim restaurant, where we ate lamb skewers, fried naan, and some other favorite dishes. After my family had grown accustomed to the big crowds so common in China, it was neat to find some quiet spots even in Beijing. On my family’s final day in China, we had time for some final sightseeing—we took the subway to the Lama Temple just a few stops north of our hotel to see the very large 55-foot Buddha (and the interesting array of small Buddha statues on display in another hall that served as a sort of museum) and the Confucius Temple and Imperial College, where students would prepare for the civil service examination. While I’d been to both sites previously when Zach and I were in Beijing for Chinese New Year, the weather at the time had been windy and below freezing, so I found them much more enjoyable this time around! For lunch, we stopped at a vegetarian restaurant that offered meatless versions of famous Chinese meat dishes– we tried some fried shrimp, lamb skewers, and sweet and sour pork all magically fashioned from tofu and veggies. In the afternoon, we did some final souvenir shopping and then headed to the airport– and I finally got to see the shiny Terminal 3 built for the 2008 Olympics. After two weeks with Mom, Dad, Daniel, and Heidi, I really got used to having them here! I’ll miss being with family, but will be excited to be returning home in just over a month myself. I’m so excited that they got to share a little bit of this incredible year with me– to see the one-of-a-kind palaces, temples, gardens, mountains, and walls; to sample my favorite foods from street stalls, hole-in-the wall restaurants, and the shiny Taiwanese and Japanese chains found in Chinese shopping malls; to eat fried noodles and steamed buns for breakfast; to become experts at riding the subways in three different cities; to see the poodles with their ears dyed blue and orange; and to simply experience the bustle of Chinese urban life. Zach and I will be staying in Beijing for a few more weeks so that Zach can do some research at Beijing Normal University and I can check out the Beijing Zoo for a research collaboration of my own with some UGA Social Foundations colleagues. Hopefully we’ll have a fun and productive stay here before heading back to Nanjing for our final days in China! After my family’s visit and with only one month left, I’m feeling very bittersweet– savoring the end of our time in China but also looking forward to being home! Zach and I haven’t been up to much lately– I’ve been feverishly grading final exams (done!) and Zach’s been visiting the Nanjing University Library to finish gathering documents from their online databases before we leave to spend a few weeks in Beijing. Now that I’m done for the semester, I FINALLY had a chance to update my tumblr with a few old comics and am excited to get back to a regular schedule with my sketchbook. 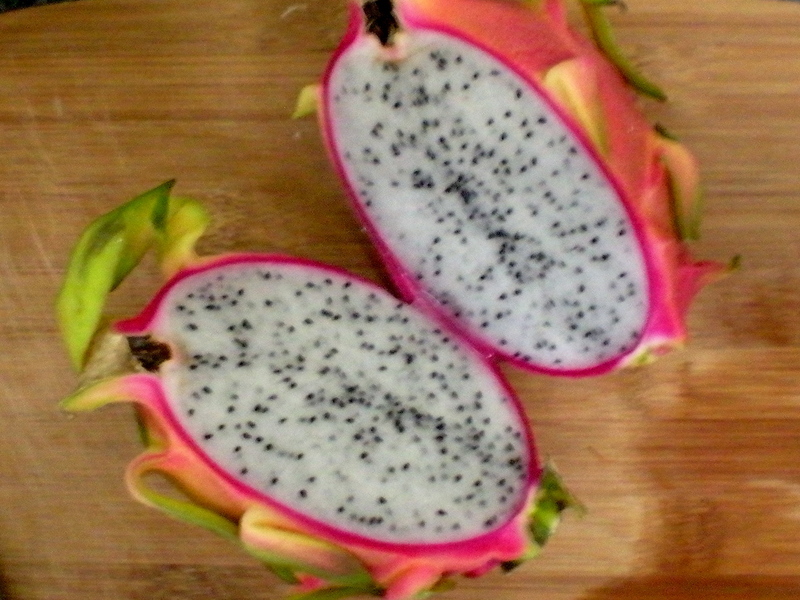 So with nothing much new to report, it’s another favorite food: dragon fruit! 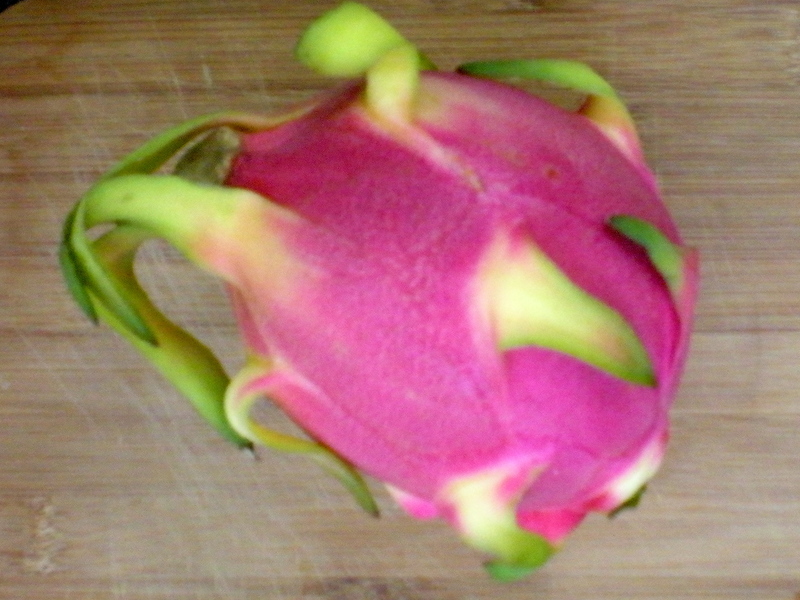 I love all kinds of fruits, and I always like to buy one dragon fruit when we visit the fruit stand for our weekly stock-up. I mostly buy them because they are so exciting to look at. The white fruit inside doesn’t taste nearly as exciting as the hot pink exterior looks. The fruit has a similar consistency to a kiwi or a melon, and is quite mild, lacking the tartness of a kiwi, for instance. I like to cut mine into slices and sprinkle a little sugar on top. Just one more delicious food I’m excited to share with my family when they’re here in Nanjing!